Garrett Michael Moore, Jr. received his undergraduate degree from Assumption College, Worcester, Massachusetts in 2004 and his law degree from Appalachian School of Law, Grundy, Virginia in 2011. Garrett is licensed to practice law the Connecticut Superior Court. Garrett has been named A Super Lawyers Rising Star for multiple years. In order to be eligible for this honor an attorney must be either 40 years old or younger or practicing for 10 years or less. Only 2.5 percent of the attorneys in Connecticut are chosen each year for this high honor. Garrett is a member of the Connecticut Trial Lawyers Association. 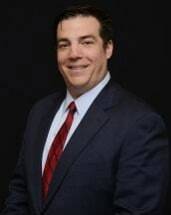 He serves on the Membership Committee and also has the distinct honor of serving on the Board of Governors of the Connecticut Trial Lawyers Association. The Board of Governors is comprised of plaintiff trial lawyers; all of whom are generally recognized as among the best trial lawyers in the State of Connecticut. Garrett is a devoted husband and father of three boys and one girl. He believes giving back to the community is essential. He is a very active board member of the Pomperaug Soccer Association.